Filet Crochet. Some Creative Ideas. Filet crochet.... A well known and somewhat old fashioned technique. But often we say that everything new is actually a well-forgotten old thing. It is also very true when we consider crocheting based on using filet mesh. Don't be in a hurry to put those old-fashioned pieces of crocheting on the bottom of your chest. They have big potential for inspiration even for any crocheter with little experience. Easy to crochet, numerous opportunities for decoration and creating unique designs, this technique really deserves our attention. This page is not about traditional filet technique. It intends to give a little "push" to your creativity and make you believe, that the most glamorous and festive garments are really made with basic techniques. HessDesign gives you a good idea about reading filet charts. Now let's try to step a little bit aside from traditional technique. 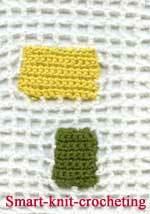 Practically all presented models are combination of traditional filet technique with other crochet techniques and stitches. This is one of the ways modern designers make old and well-known filet meshes look like fresh and innovative style. Certainly combination of a few techniques in the same garment requires pretty high level of mastery from a crocheter. But we know that "our eyes are afraid, but hands just do it". One step at a time. From the simple classical filet designs, to one step more advanced patterns where 2 or 3 different techniques are combined, and then you are ready for you masterpiece. One step at a time! Substitute one or a few meshes with a a 4-petal flower based on a mesh and you can create a new kind of crochet fabric. A "lazy" alternative of Irish crochet. Flowers are sewing on the mesh. A single crochet areas inserted into a mesh. Join-as-you go! I am going to continue a subject of filet technique on this site. It is simple but very flexible technique. It allows you to create anything from garment where a little bit tricky increases and decreases are required to shape your design to home decorating things: doilies, table runners, pictures, curtains, and so on. More creative ideas for filet crocheting designs. Filet Crocheting: How to work smooth decreases without steps. Filet Patterns. Part 2. Design your own 3-D filet crochet pattern. Free Filet Patterns. Part 3. 3-D filet patterns with popcorn stitches. 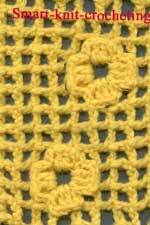 Shell Crochet Stitch. Part 4. Decorate filet patterns with shell stitches.